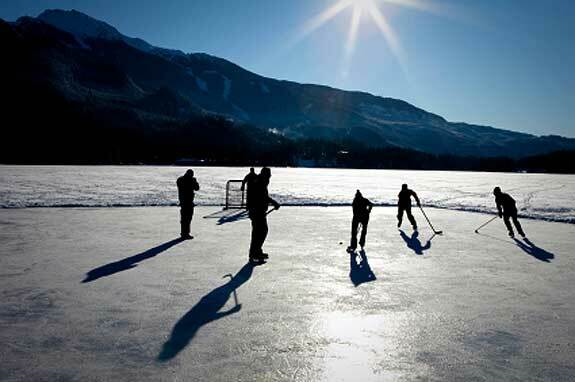 Pond hockey is a popular pastime during Maine's extended winter season. The state of Maine should be your preferred destination if you figure skate, play ice hockey or want to become either one. Indeed, the state has enough indoor and outdoor venues so that even recreational skaters can find plenty of options regardless of the season. Of the state’s eight regions, only the Downeast & Acadia area fail to offer an indoor skating rink, but this is more than offset by rest of the state’s 35 indoor arenas. There are different types of indoor rinks in Maine with varying degrees of public accessibility. Some indoor arenas are municipal facilities, open to the public for small fees. Call ahead of time or check the schedule as many municipal facilities not only schedule recreational skating but also serve as game arenas for local recreation hockey leagues and high school teams. Some facilities also rent private time for figure skating instruction. Colleges, universities and some private schools also have indoor arenas with limited degrees of public access. Call ahead before showing up with your skates. Finally, some private business owners have opened arenas open to the public. Again, call ahead or check an online schedule to assure that the rink will be available for your needs. This list is by no means the exhaustive list of outdoor skating venues for Maine. Many lake areas have traditional coves utilized by locals for seasonal ice-skating. Inquire as to availability of these areas from the local citizens, the town office or the local Maine Warden Service. The Warden Service should also be consulted as to the ice safety of any body of water that appears appropriate for skating. In addition to relatively unknown lake coves, the very large and very well known winter ski resorts typically offer an outdoor rink for ice-skating. An example of a resort rink would include Sugarloaf s NHL-sized ice rink. Maine’s outdoor ice-skating experience can range from rural Haley Pond’s warm — and free! — welcome all the way up to Portland’s urban Deering Oaks Park. Deering Oaks Park in Portland is the city’s historic and famous 52-acre park designed in 1879 and originally intended to remain in a relatively natural state. Luckily for current citizens, the park now contains a baseball field, tennis courts, children’s playgrounds and a pond. The park’s pond is located at the intersection of State Street and Park Avenue and is open each year from December to February, from 6 AM to 10 PM. Call 207-756-8275 or 207-874-8801 for any updates or questions about the pond’s availability. If unavailable due to weather, you can always switch your location to Portland’s Ice Arena. Haley Pond in the Rangeley Lakes area is the site of the annual February New England Pond Hockey Tournament. It offers free skating and free skate rentals to visitors.